Fruit Cake Recipe. – Where Is My Teaspoon? Friday day everyone! The weekend means weekend baking and I have a perfect Summer Fruit Cake for you to try out. There is something so pretty about how basic and homemade this cake looks, it needs no icing or jazzing up. The fruit and flavour will carry it alone. I brought this cake into work the other day and it went down really well so think it could be a winner. Fruit cake is something that has gone a bit out of fashion in cafes in favour of rich butter cream and multiple layer cakes but some people still absolutely love it even if it’s not what’s trending these days. If you know anyone who is a fan but would never bake one themselves, it is a perfect gift. If you follow me on Instagram, you might have already spotted this one – couldn’t help but post it! My cake was baked in a 7in tin. Grab your tin and preheat the oven to 160 degrees. This is a low and slow bake so best to do it on a lazy evening at home. Grease and line your tin well. Wash the cherries and dry well using kitchen paper. Cut the cherries and the apricots into quarters. Depending on the size of the apricots, you might want to cut them even smaller. Sometimes you get massive ones in packs and other times they are tiny so use your own judgement here. Cream the butter and sugar together and beat in the eggs and almond extract. Add the flour and mix until well combined and smooth. Follow with all of the dried fruit and beat well. Plop the cake mixture into your tin and use the back of a spoon to make sure the top is flat and even. Bake in the oven for 90 minutes or so. I would recommend you check the cake after an hour to make sure it isn’t catching in the heat – it might need to tinfoil hat. When a knife comes out clean, take the cake out of the oven and turn it out. Leave the baking paper on the cake and wrap in a damp tea towel. Let it sit here over night. In the morning, remove the tea towel and the baking paper and you’ll see a lovely, soft fruit cake! 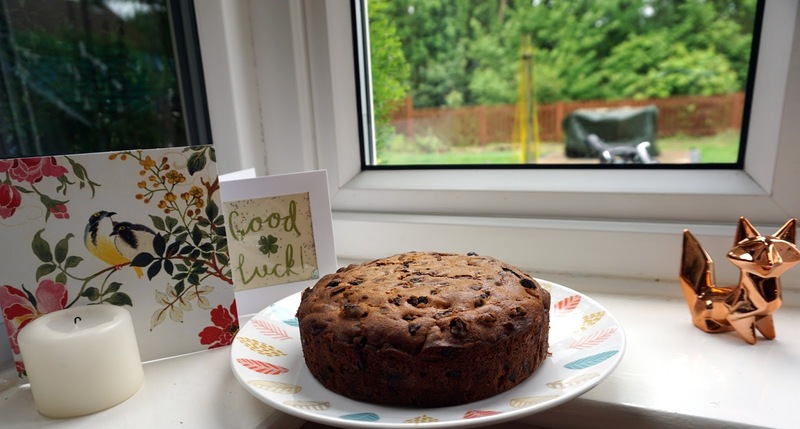 This cake is perfect for summer as it doesn’t use dark brown sugar, brand or treacle and so is a much lighter tasting fruit cake to the common ones we get from shops. We enjoyed it at work for big mugs of tea at 11, maybe you can too! 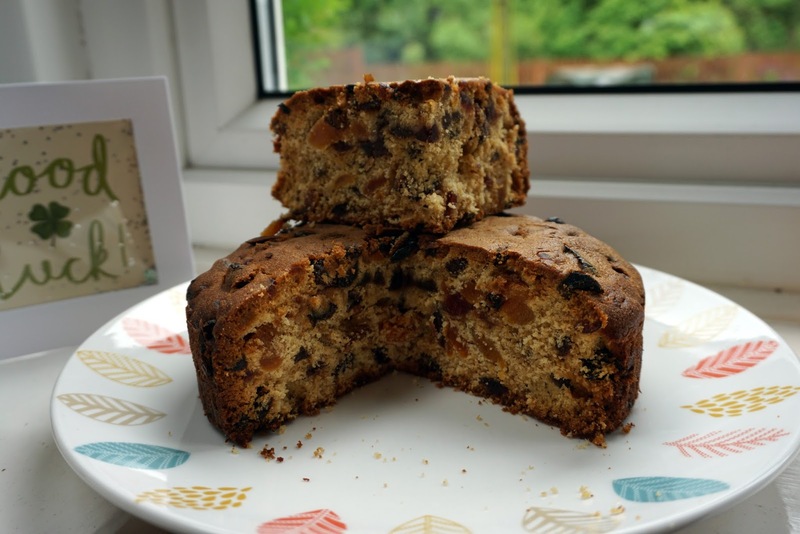 Let me know if you liked this recipe or if you are a lover of fruit cakes in general? Do you think they’re going slightly out of fashion?